Taking Appearance Seriously is a rare philosophical work of both outstanding quality and immense practicality, written to guide the reader into really experiencing what Henri Bortoft calls the dynamic way of seeing: a radically aware way of thinking and comprehending our complex world which is as applicable in the creative arts and business world as it is in science. Clever, funny, giving. Henri took words to places I thought they couldn’t go. I am extremely happy today to be able to announce the start of a new project on Transition Consciousness, the publication of Henri Bortoft’s 2009 lectures at Schumacher College, a long-desired project which has been made possible through the support of Jaqueline Bortoft and Schumacher College. Henri Bortoft (1938 – 2012) was a physicist and philosopher who studied the problem of wholeness in quantum physics as a postgraduate student under David Bohm. He then went on to work with the philosopher J.G. Bennett where he would extend his studies of wholeness into the areas of phenomenology and hermeneutics. Henri would then take a deep interest in the scientific work of Johann Wolfgang von Goethe, resulting in the publication of his 1986 monograph Goethe’s Scientific Consciousness. This work was expanded into what is now regarded as one of the greatest articulations of Goethe’s approach to science in The Wholeness of Nature: Goethe’s Way of Science published in 1996 by Floris Books. Henri would then spend the next years working on his final book Taking Appearance Seriously: The Dynamic Way of Seeing in Goethe and European Thought published in 2012, also by Floris Books. While not publishing extensively, Henri also contributed chapters to Wider Horizons: Explorations in Science and Human Experience and Goethe’s Way of Science: A Phenomenology of Nature. He also was the joint editor of the most recent edition of Ernst Lehrs’ Man or Matter, which explores a spiritual approach to science through Goethe’s methods in observation and thinking. Henri’s work is powerful because it provides us with a radically different and powerful new way to understand systems. When his dynamic conception of wholeness is truly understood, it changes our way of seeing, and takes us into an understanding of experience, meaning and being. These are not just questions for science and philosophy, but for helping us understand our relationship to other people, to nature, to design, to architecture and to the development of new organisational structures. It was Henri’s dynamic conception of wholeness which inspired Maria and I to write our own book Holonomics: Business Where People and Planet Matter. In Holonomics we introduce readers to Henri’s philosophy of wholeness, and show how it can be understood in relation to systems thinking and complexity science, the development of new business models, and also how it relates to changes in our mental models, leadership and the transformation of consciousness in organisations. Our second book, Customer Experiences with Soul: A New Era in Design, extends these insights from Henri’s work, notably the dynamic way of seeing, into the area of customer experience design. In this book we introduce our tool, the Holonomic Circle, which articulates the meaning of soul in a design, business and branding context. This framework takes its inspiration from the hermeneutic circle, an approach to understanding meaning in texts and works of art which Henri explored extensively. While a number of other writers have cited Henri, such as Otto Scharmer (Theory U: Leading from the Future as it Emerges), Thomas Johnson and Anders Bröms (Profit Beyond Measure), and Philip Franses (Time, Light and the Dice of Creation: Through Paradox in Physics to a New Order), one other writer, designer and holistic scientist who has written about Henri’s philosophy extensively is Emma Kidd in First Steps to Seeing: A Path to Living Attentively. In 2011 I created the Henri Bortoft Facebook page in order to create an online presence which he had not previously had, with the aim of sharing both his work and also related studies, articles and reflections from other researchers, writers and practitioners. By way of an introduction to Henri, I wanted to provide this brief outline of some of the writers, designers and business thinkers who Henri has influenced in order to emphasise the important applied aspects of his work, as opposed to just discussing the theoretical and philosophical aspects. (In the final supplementary article in this series I will provide as an extensive a list as possible of further references). My motivation for doing so was to help you understand the context behind my happiness in being able to publish Henri’s lectures from Schumacher College. 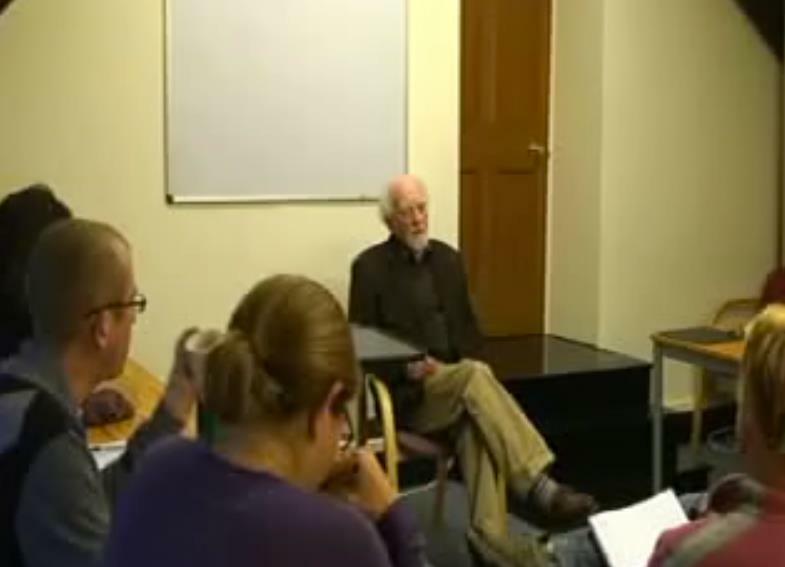 In 2009 a decision was made to film Henri’s week of lectures since it was clear that due to his long-term illness it may well not have been possible for him to be able to continue lecturing for too much longer. While his lectures from subsequent years were recorded in audio format, these recordings were the only ones from Holistic Science to be videoed. Henri’s teachings formed the basis for the masters degree course in Holistic Science which is taught there, and which Henri helped to develop more than twenty years ago along with ecologist Stephan Harding, Goethian scientist Margaret Colquhoun and the late visionary biologist Brian Goodwin. Henri was able to push language to its limits and explain philosophy in a verbal manner which had the effect of drawing attention to the meaning of what he was saying in a manner which is almost impossible to replicate in written form. 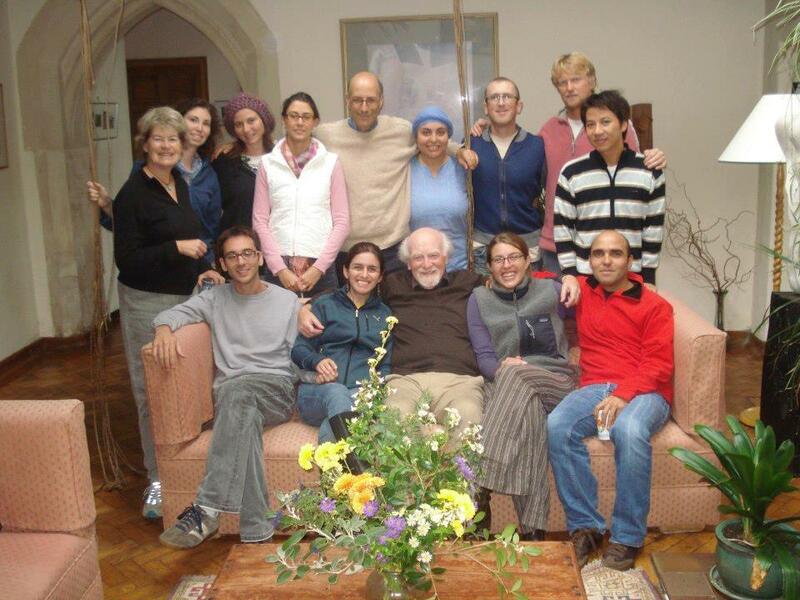 As one of the students in Holistic Science in the 2009 I had the huge privilege of spending this particular week with Henri, a week which provoked one of the most profound shifts in my thinking I have ever experienced. This shift did not happen during that week itself, it was in the months and indeed years of continuing to study and apply Henri’s philosophy that I would really come to appreciate the depth and importance of the dynamic way of seeing and how I could then start to apply the insights in business, innovation and design. In order to develop the expansion of consciousness which comprehending the dynamic conception of wholeness entails, as well as returning to The Wholeness of Nature (Taking Appearance Seriously had not yet been published), I also went back to the video recordings which I had taken copies of. This is a an approach to this lecture series which I can therefore strongly recommend – working with both his books and these lectures in conjunction to truly be able to enter into the experiencing of what Henri is discussing. 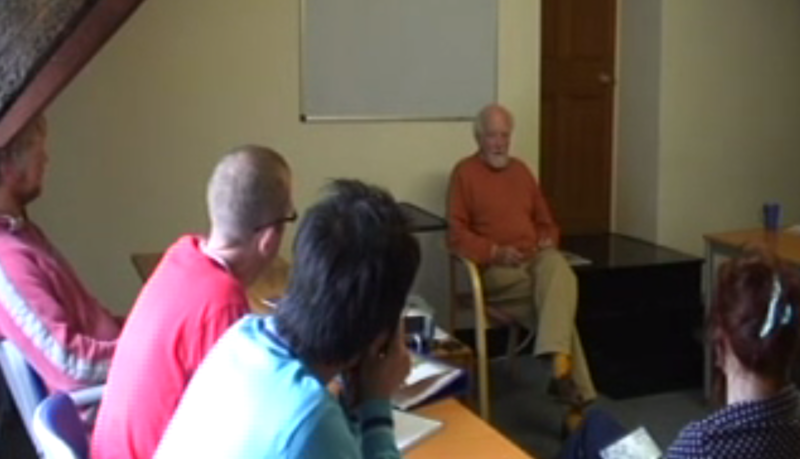 Although the main video files had been stored at Schumacher College, over time I believe that they had become lost. Some years ago I went back to the recordings that I had kept, but unfortunately the audio had become corrupted to the point where it was almost impossible to listen to. However, a couple of weeks ago I discovered a different set of the recordings on my computer and to my surprise the audio was in perfect condition. Given that the reason for making the recordings was to ensure that as many people as possible would have the opportunity to hear Henri in full flow, I sought permission to make them publicly available. As these lectures are so precious, I wanted to provide this introduction to Henri and his work. Over the next week or so I will be releasing the complete set of lectures, and I will also be providing short introductions to each one to help provide a little narrative and additional context. There are four days of lectures, broken up into two parts. My plan is to release one day’s lectures at a time, and I will be adding links to each one on this page too as they are released. 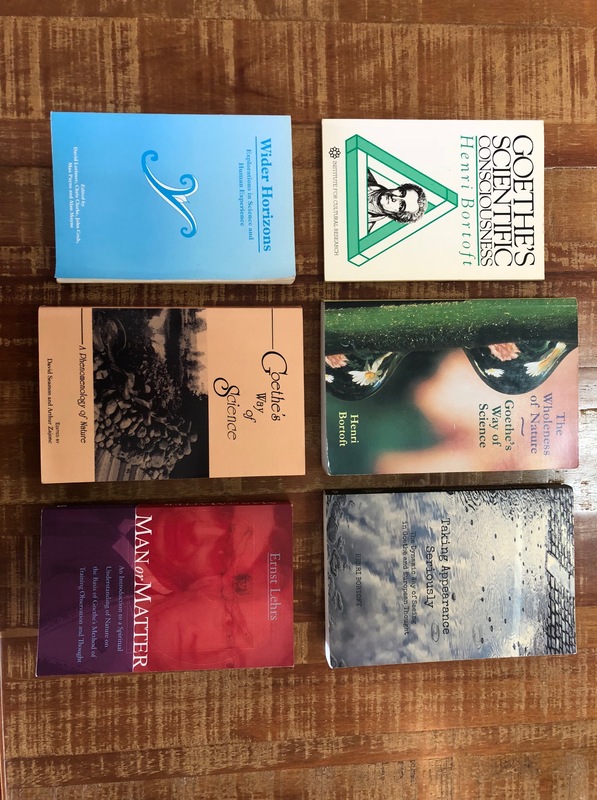 I am extremely grateful to Jacqueline Bortoft and Annie Adams from Schumacher College for allowing me to make this possible.